Feeling encouraged by the appreciative public response to my Everton Road murals; in late Sept 2015, I started to draw up my wish list sites for my future murals. Chinatown and Tiong Bahru were my immediate targets. 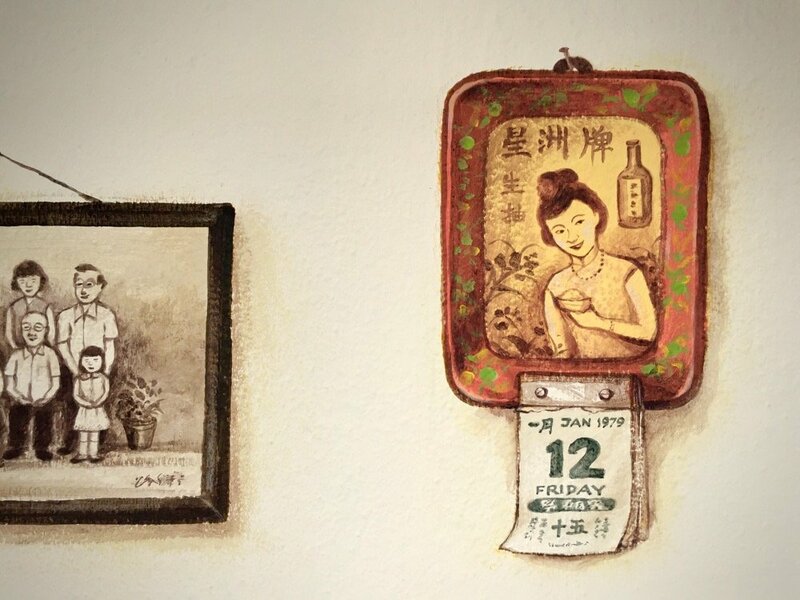 Chinatown was where I grew up (Read YC’s blog “Sago Lane, Street of the Dead”), and Tiong Bahru was my childhood playground where my cousins, siblings and I ran around the estate to hunt for the Saga red love seeds littered from the estates’ many Saga trees. 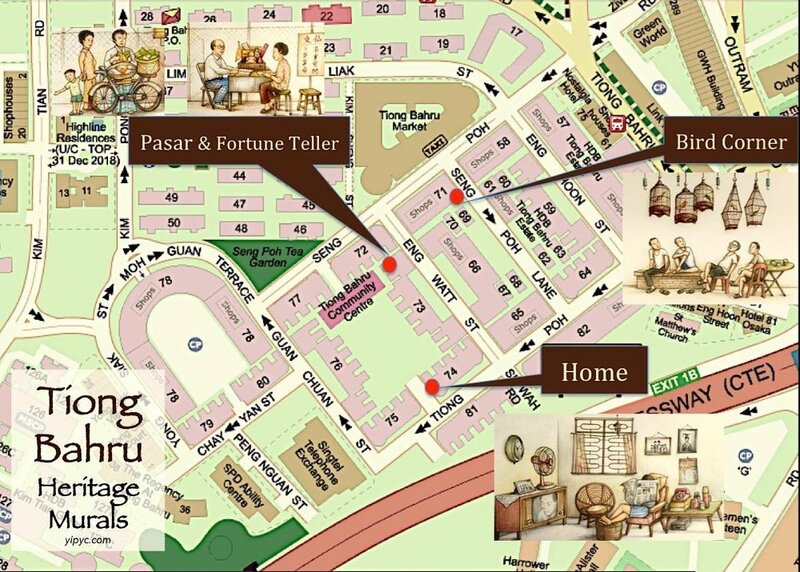 Three of my aunts still live in Tiong Bahru today. I feel connected with these two places with a sense of belonging and fond memories. As they are also conservation areas with unique history and identities, they are very suitable sites for painting heritage-themed murals. 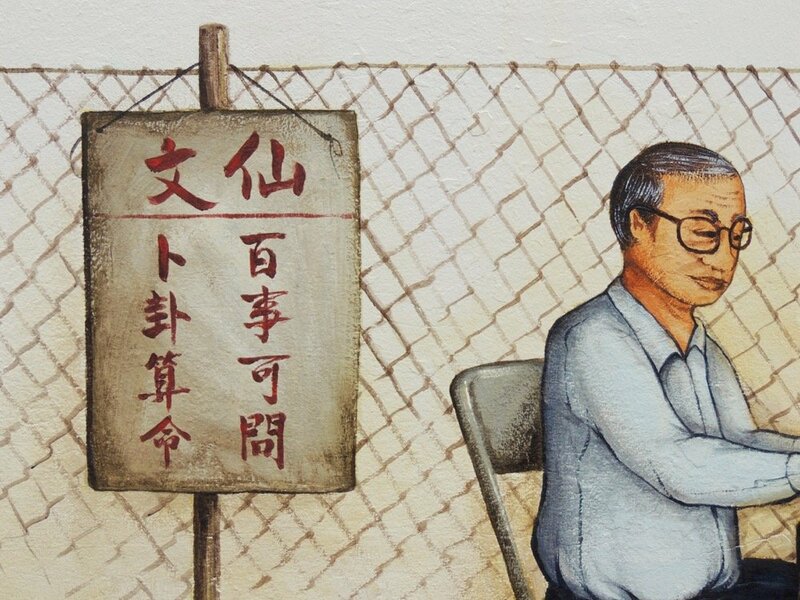 In Sept 2015, I went around scouting for walls in Chinatown and Tiong Bahru. 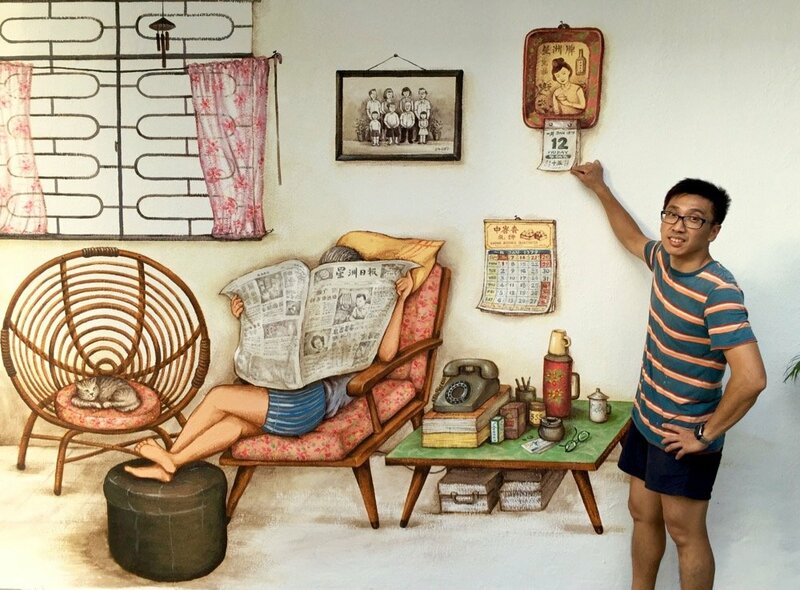 I found Tiong Bahru more suitable as a place for murals due to the abundance of clean white walls lining the quaint back alleys and corridors, whereas those in Chinatown backalleys were greasy with stuff piled up. However, the walls in Tiong Bahru were much smaller, and often blocked by thick pillars. During the Tiong Bahru recce, I spotted the remnants of the credit plaques of the Roosters and Goldfish murals done by Ernest Goh. The sticker murals had peeled off due to the weather conditions, but I found a plaque intact with the Resident Committee contact on it. I got excited when I noted the fine print on the plaque was encouraging the public to come forward with future mural ideas. 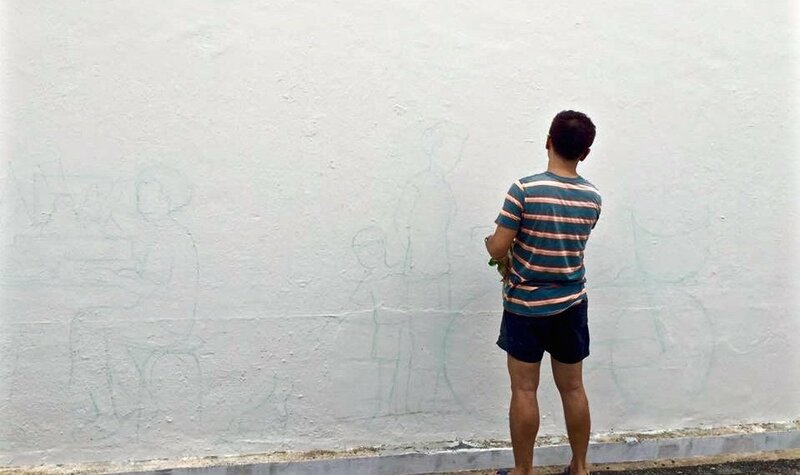 With excitement, I sent an email to the Resident Committee to express my interest in creating murals in Tiong Bahru. When I didn’t get a response after almost two weeks, I was about to give up on the idea, thinking that they were not keen. Until one day, while chatting with a friend over coffee, I was advised to contact a well known Tiong Bahru resident who is a champion of the estate’s culture and conservation. With a quick online research, I managed to contact this champion resident who responded swiftly! I soon learnt that the champion resident is actually also a member of the Resident Committee. When he apologised for the Committee’s delayed response, I felt empathetic and apologetic too because I understood that the Resident Committtee is made up of volunteers with day jobs. As a volunteer myself, I admit that it is a continuous struggle to catch up on both my day-job work emails and volunteer-work emails. Soon after the Resident Committee and I got in contact, they invited the community Arts Council to join in on the collaboration. Together, we discussed the preliminary concept of the mural project. The joint committee expressed keen interest and even indicated that the redecoration was timely because the whole Tiong bahru estate was about to undergo repainting work. They then requested for me to prepare a proposal. 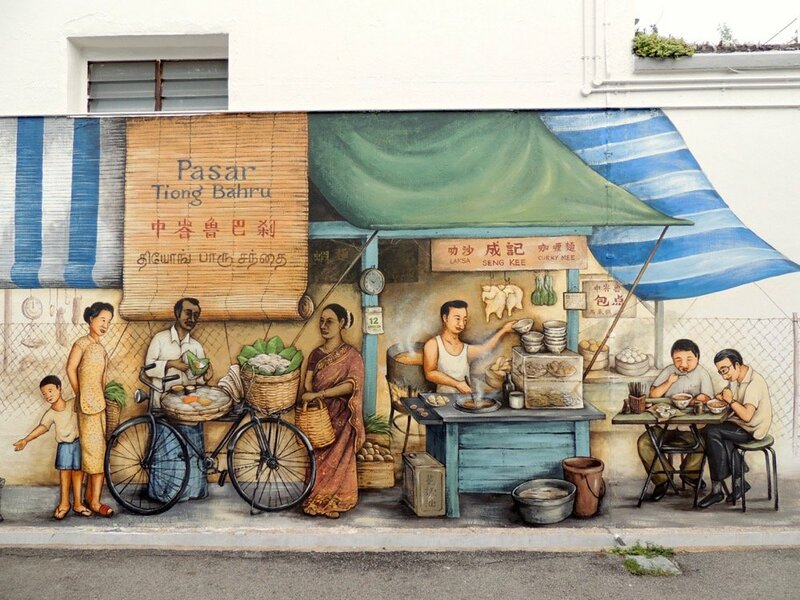 My initial proposal was to paint 5 heritage murals depicting historical scenes of Tiong Bahru, with options to paint the murals selectively or entirely. They were mostly concentrated around the Community Centre and Market areas so as to form a cluster within short walking distance, suitable for the elderly. Initially, I priced each mural according to market prices. However, in December 2016, while we continued to consider options for the project, I had found a job and was ready to return to the corporate world with the start date in mid February 2016. Due to time and resource constraints, we decided to do 3 of the 5 murals. In fact, the “Bird Corner” was not chosen at first but I threw it in at a good discount because I felt that the series without the “Bird Corner” would be missing an icon, as it already is in reality. I further explained that although I wasn’t doing public street art for money, I wanted to uphold or even increase their value in Singapore, which at times, may have been taken for granted as free with no value. Ultimately, I agreed on a nominal allowance for the murals. I considered this project to be pseudo community work. We also dispersed the locations of the murals to spread out the areas of interest. When we were choosing the locations, we tried to ensure that the residents’ privacy would not be compromised and businesses not obstructed. Upon finalisation, we submitted the plan to the relevant authorities for approval. The final locations of the murals. This serves as a good walking map guide. We submitted the approvals for the murals to three authorities in January 2016. Two of the authorities granted their approval quite efficiently, while one authority was less structured and did not provide an estimated reply date. I knew I had just enough time to complete the murals before my return to the corporate world in mid February immediately after Chinese New Year, so I was following up on the approval status almost daily. When I started my new job, the approval was still not granted, resulting in us missing our targeted unveiling of the murals as a gift to the residents for Chinese New Year. Even after I had started my new job, there was still no news of the estimated reply date and no indications of what the authority’s concerns were. In my mind, I had resigned to the fact that the project would not materialise. Then, three weeks into my new job, the approval came! Thereon, I spent the next 5 weekends painting the murals while holding a full-time job. I even had a business trip to Dubai during the period. It was indeed tiring, but I felt motivated to fulfil my dream. 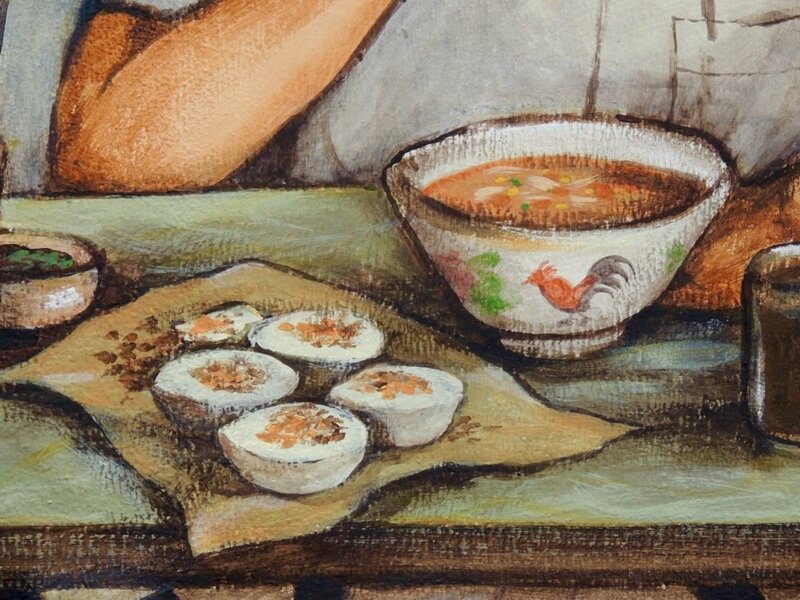 The semi-sheltered corridors of the “Bird Corner” and “Home” were a luxury to paint at, whereas the hot sun and occassional showers of the outdoor “Pasar and Fortune Teller” mural was toil. The toil melted away when supportive friends, residents and my family visited me, stuffed me with food, drinks and even wine (from an Italian resident family). I was touched when my uncle who is still living in Tiong Bahru came by on his wheelchair! I am very grateful to the Resident Committee who rallied the residents to give me logistical support, and the community Arts Council for unrelentlessly chasing after the approvals from the authorities. I was happy I could paint much faster than when painting the Everton murals, but I also felt rushed because my next mural project at Waterloo Street had an unveiling deadline which could not be postponed. I painted the Bird Corner in 1.5 days, Home in 2 days and Pasar & Fortune Teller in 4.5 days. Each day averaged 12 hours of work. 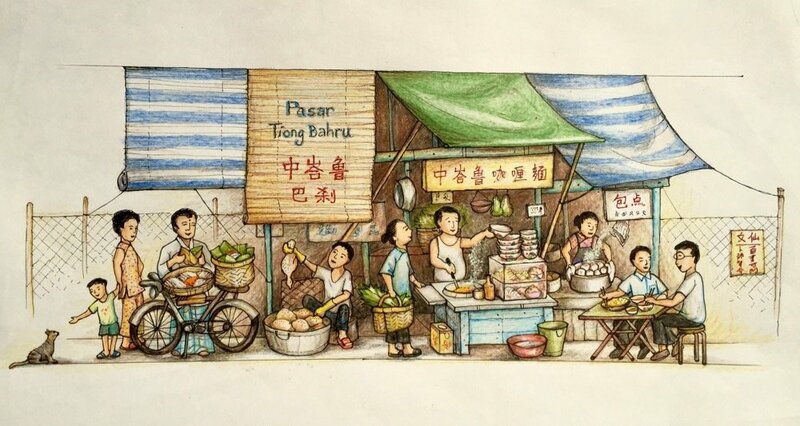 On the last day of the Pasar mural, I added a small squatting stall which sells traditional cakes and kuehs, based on a resident’s suggestion. Almost immediately after the Kueh stall was “set up”, an elderly lady patronised it! But don’t worry, the Kuehs will never be sold out. 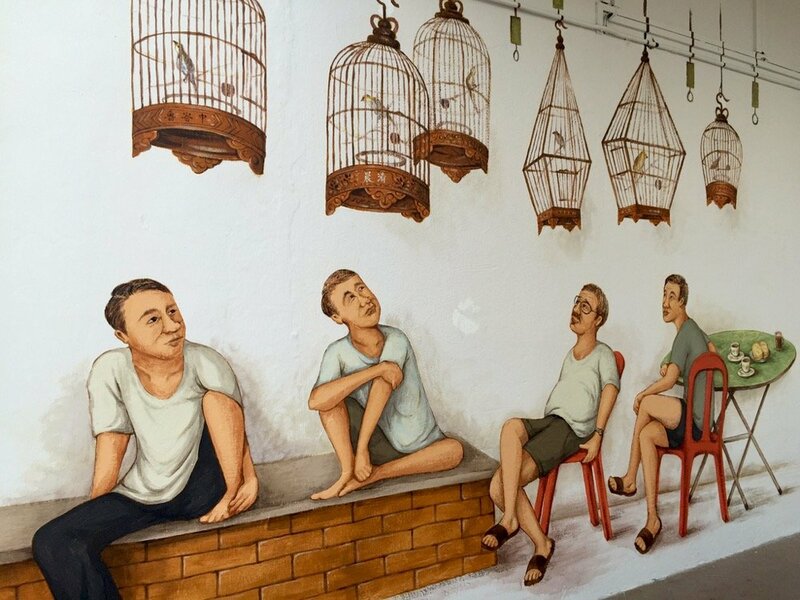 Bird Singing Corner – To many people, one of the most commonly thought-of scenes of Tiong Bahru has to be the bird cages and their owner uncles sipping kopi. Unfortunately, it is a bygone scene. The original location is beside the current Link Hotel. The hotel once attempted to revitalise the activity but the reality is that the uncles and their birds have mostly moved out of Tiong Bahru. Today, the hooks are still dangling and waiting for the birds to return, to no avail. 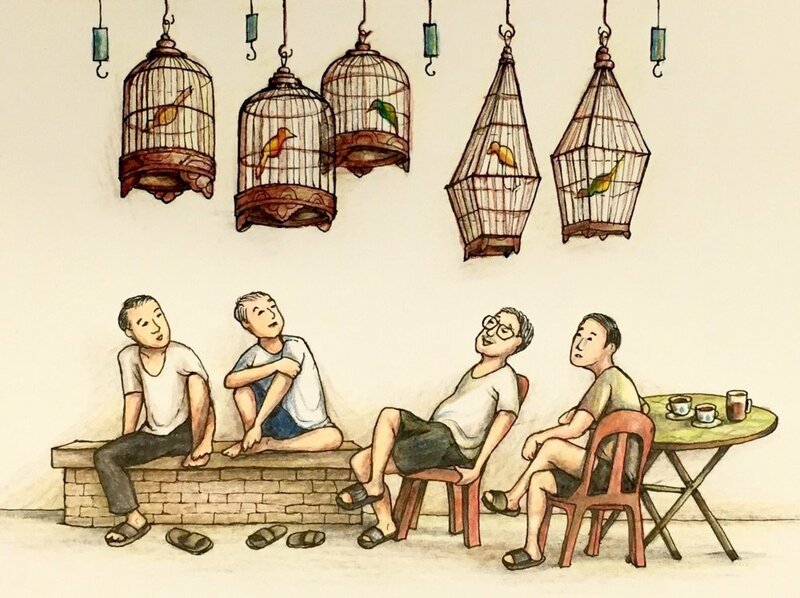 When I conceptualised this, I was concerned that I may be perceived as promoting caging of birds, which is contrary to my personal value to respect the natural habitats of fauna. I was especially concerned since I am also a Board member of the Nature Society, an NGO which promotes the appreciation, conservation and protection of Singapore’s natural flora and fauna heritage in their natural habitats. 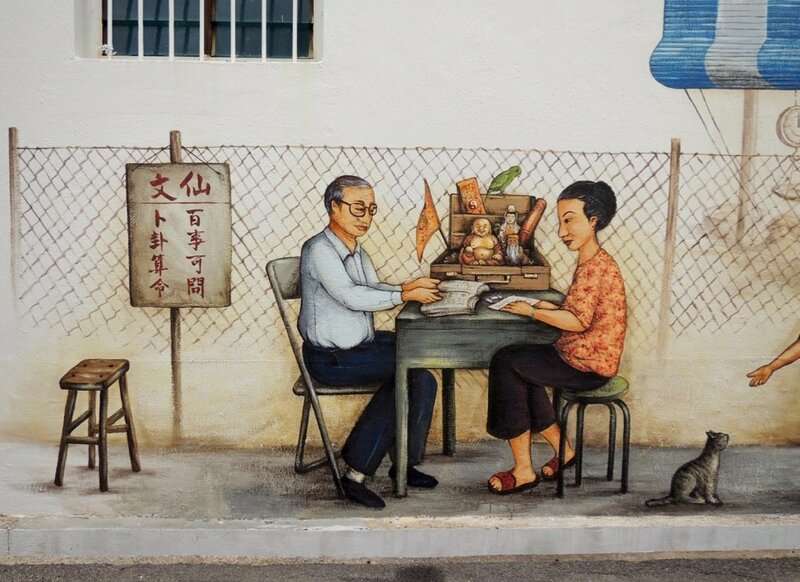 I decided to proceed anyway after considering that the scene was an undeniable part of Tiong Bahru’s culture and history. When creating art, it is common for artists to be caught in between expression which upholds one’s values and self-censorship. Home – I’ve always wanted to paint murals which are relevant and reflect the history and ambience of the site. 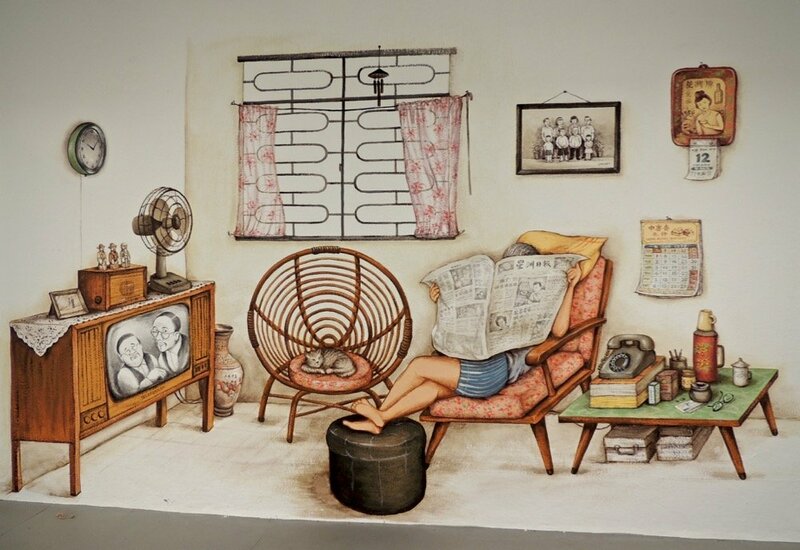 Tiong Bahru being a housing estate, and being one of the first public housing estates in Singapore, is most suitable to carry a scene of the inside of the home. 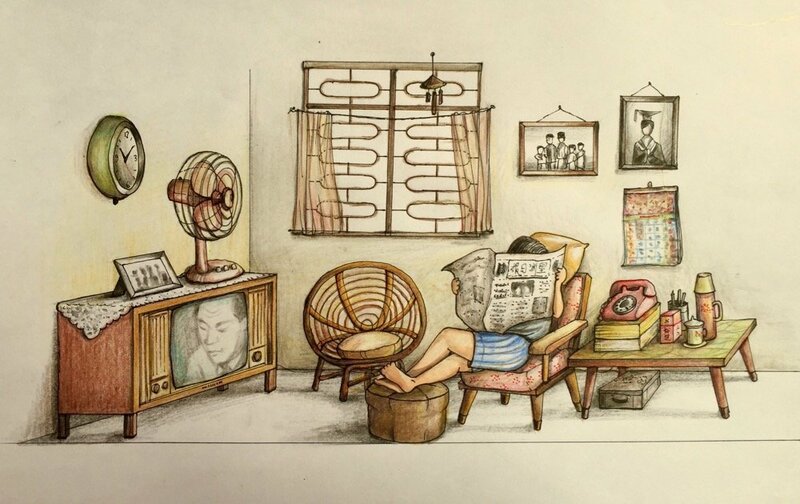 I know that some of the homes in present day Tiong Bahru is still furnished the traditional way, and many visitors tend to “peep” into these homes. 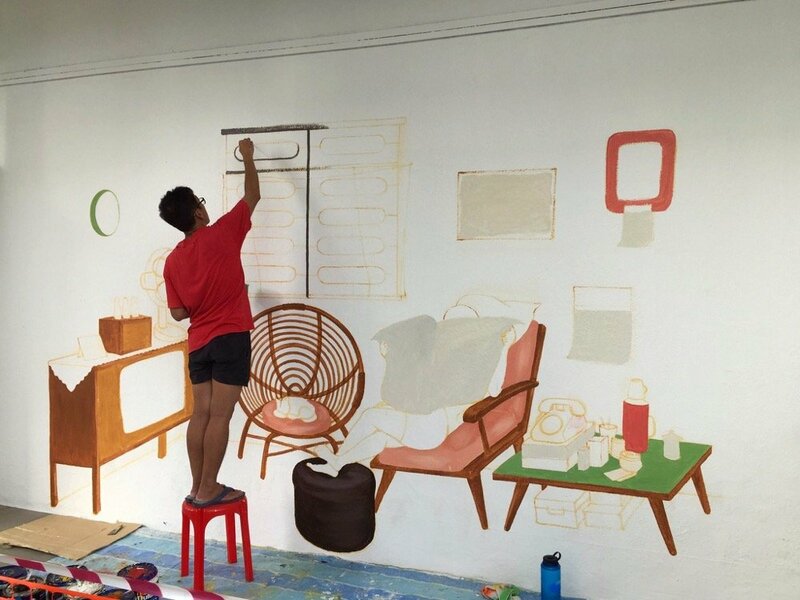 I thought that if I can paint a typical home furnished in the traditional way, the mural can actually act as an alternate “showroom”. I enjoyed conceptualising the “Home” mural most. 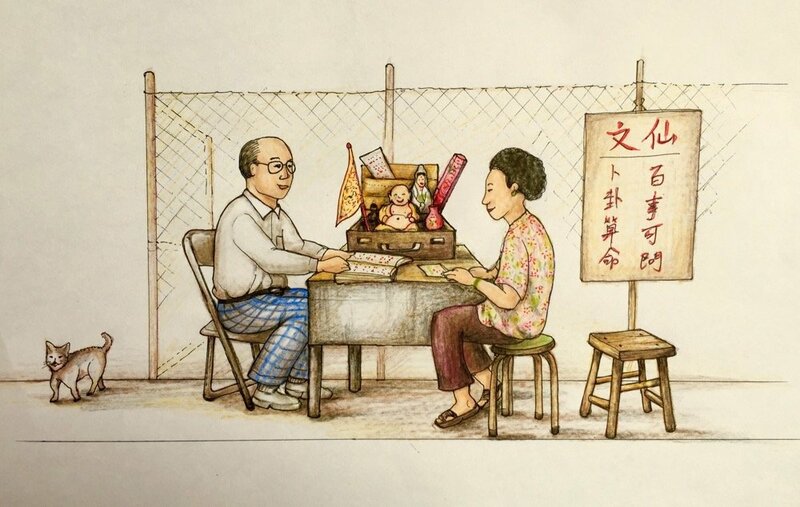 I drew the sketch almost from pure memory of my own home in Sago Lane, Chinatown. We had our first sofa set and telephone in 1977. The sofa replaced the rickety wooden chairs and stools scattered around the living room. The sofa set was actually recycled from my aunt’s home in Tiong Bahru! I remember that as a kid, I was so happy to be able to slouch on a sofa at home. 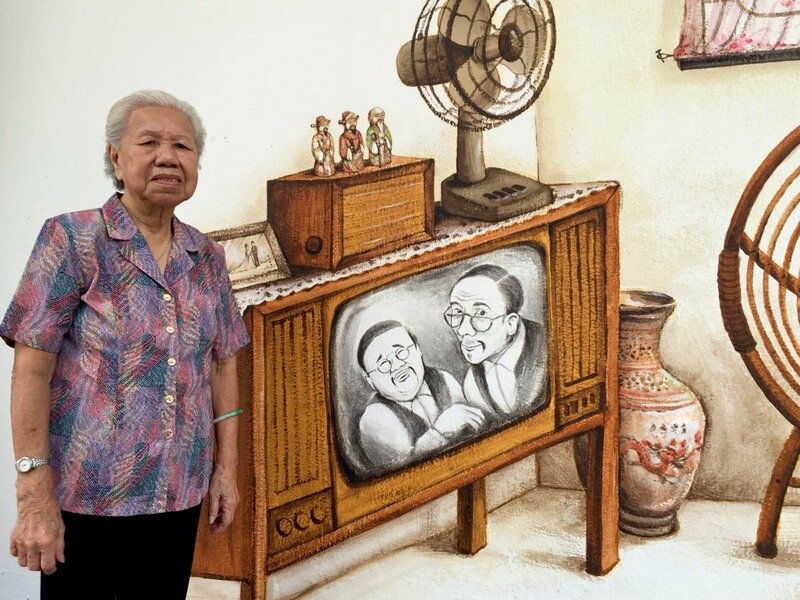 Did you notice that on my sketch, the image on the TV was that of our first PM Mr Lee Kuan Yew announcing Singapore’s separation from Malaysia in the 60s, but the actual mural was that of Wangsa Yefung, a popular comedian duo in the 70s? We decided to change it because the sentimental historic moment didn’t quite fit the room’s lepak setting! 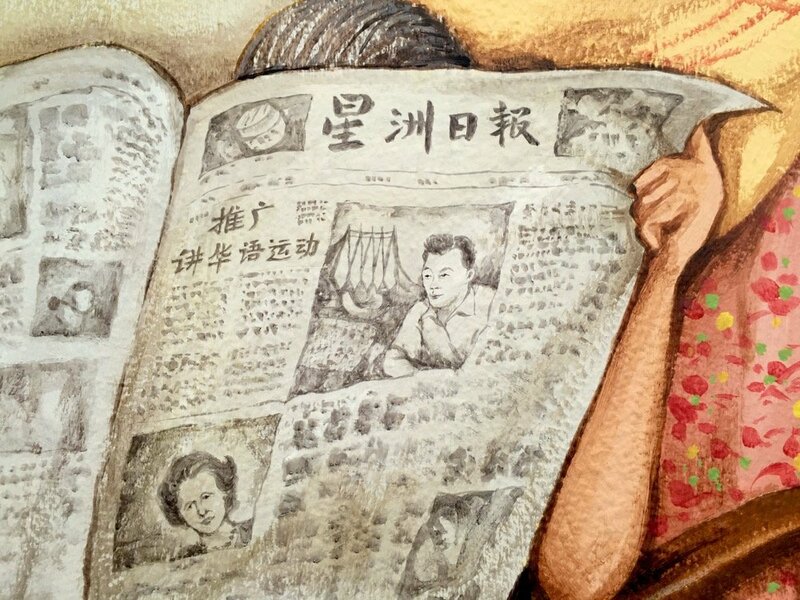 Instead, I painted Mr Lee’s image on the newspaper, of him promoting the Speak Mandarin Campaign in 1979. His good friend Margaret Thatcher, ex PM of the United Kingdom, was also painted on the newspaper, even though she was only appointed in May 1979 but the date of the calendar was 12 Jan 1979. The original sketch of “Home”. Drawn almost entirely from memory. As a kid, I was so happy when my home in Sago Lane got its first sofa set, even though it was a second hand set recycled from my uncle’s home in Tiong Bahru. It was a luxury! These were actually two murals during conceptualisation, but I eventually combined them into one. The “Pasar” (Malay for market) was originally not chosen by the committee due to its high costs but they liked the concept. In the end, we simplified its design, combined it with the “Fortune Teller” and reduced the costs. Otherwise, the Fortune Teller who used to sit outside the Pasar in real life, would look out of place without the Pasar. The mural series would also be missing its pivotal focal point – the market place. 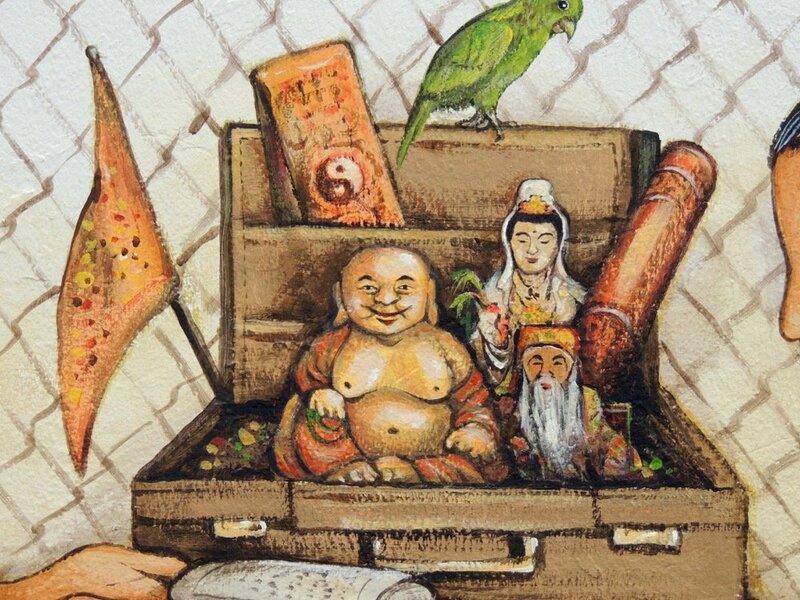 When the mural was completed, I tried to use social media to find the original fortune teller, whom I had painted based on a small black and white photograph. I thought it would be touching for him to view the mural of himself, complete with his unusual business attire and his signboard. Unfortunately, in just less than a week of the hunt, I received information that the man had passed on some years ago. The “Fortune Teller” mural. Unfortunately, I could not invite the real fortune teller to view this mural. He had passed on several years ago. The fifth mural, a scene at the “Community Centre” did not make it to the series due to time and resource constraints. The “Community Centre” mural which did not materialise. In fact, there was to be a 6th mural – “The Cobbler”. 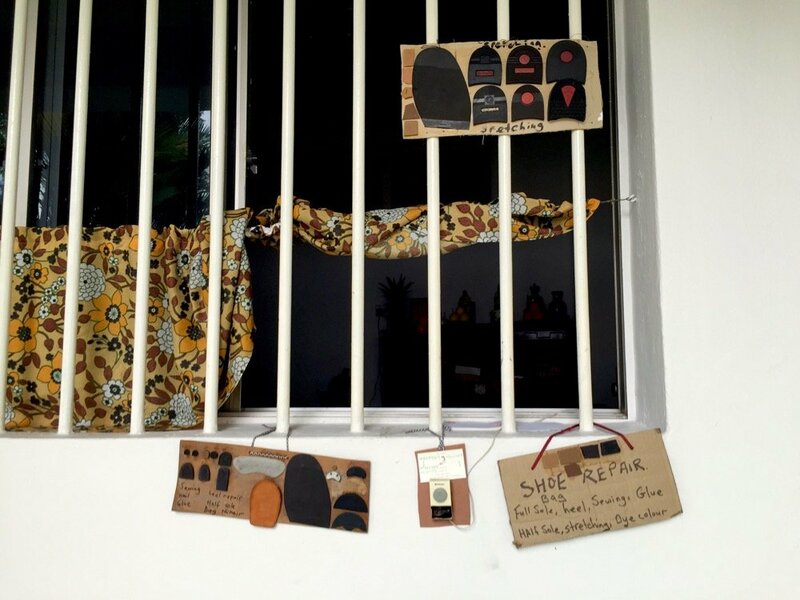 I had aspired to paint the cobbler after chancing upon a cobbler operating in his house along Moh Guan Terrace (picture). It did not go into the proposal after I felt exhausted drawing the first 5 sketches. I have been thinking where this mural painting will lead me to. I admit that I am still enjoying the appreciation and recognition so far. 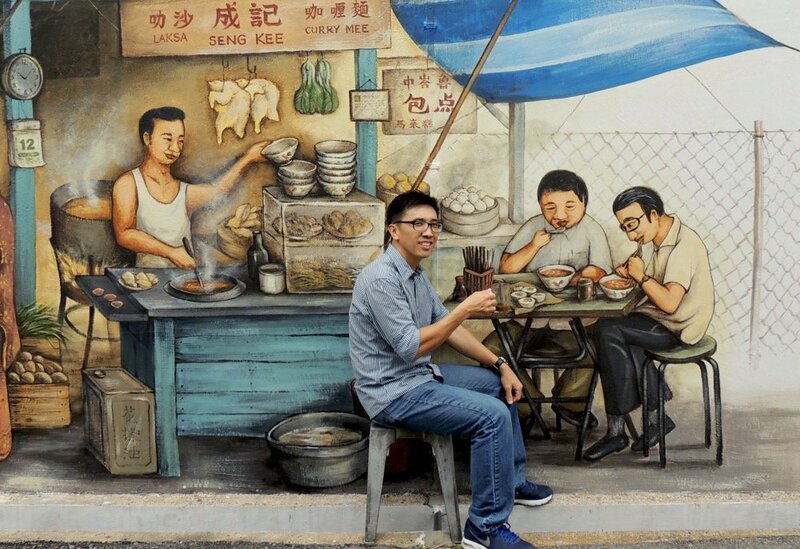 I especially feel appreciated to see the public, young and old, Singaporeans of all races and foreigners alike, posing and taking photographs at the murals. However, I know that someday, I will need to cut down or even stop painting murals altogether. I know I will get tired, people will also get tired, and some walls are best left alone. I also understand that all my murals will fade over time and be whitewashed over. Murals are never meant to be permanent. Meanwhile, I aspire to create a series in Chinatown (hopefully the Chinese Opera Stage scene can be painted there) and a series in Little India (scenes and landmarks of South Asia, for our hardworking foreign worker friends, to let them feel at home. I think most of them will not have a chance to visit those places in their own countries!). When I stop painting murals, I want to practise painting on canvas and study art. I always feel inadequate being untrained in art. Declaring myself as “self taught” is a good short term excuse but if I want to progress, I need to get some proper training someday. Till then, I’ll continue to bask in the sunshine, just like my murals, before they fade away. 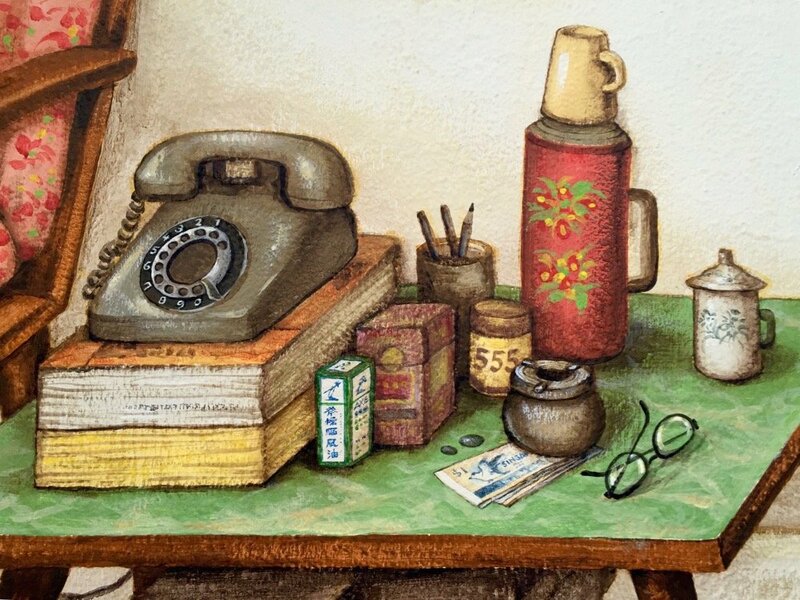 “Home” – My family installed a telephone at our home in Sago Lane in 1977. We had so much fun calling our cousins in Tiong Bahru. 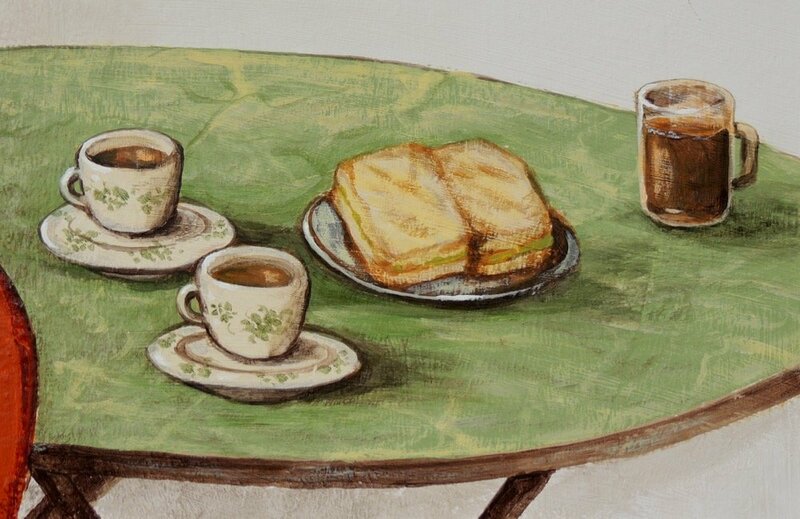 On the table, you will find my dad’s ash tray and my grandmother’s 555 cigarette tin. The typical calendar we used to hang on the wall. Sin Chew Jit Poh (Singapore) was merged with Nanyang Siang Pau in 1983 to form the present day Lianhe Zaobao. In 1979, Mr Lee Kuan Yew promoted the Speak Mandarin Campaign. It was funny to watch Hong Kong Cantonese drama series dubbed in Mandarin from that year onwards. Here’s my dear aunt, a Tiong Bahru resident for many years. She is 89 this year, yet she walked all the way from the far end of Kim Tian Road (near Jalan Bukit Merah) to visit me during my painting. When she arrived, she was exhausted, but smiled immediately upon spotting her favourite comedian duo on the TV! Somewhen around 1979, we had our first set of boxy monochrome Telefunken TV, again generously given by my Tiong Bahru uncle when he bought a colour TV. On the second day of painting “Bird Corner”, I added 4 fluttering pigeons. The caged birds were jealous! My wife loves Zhui Kueh and I love Laksa for breakfast. My dad and my daughter love Putu Mayam. Nowadays, it’s hard to find them in the hawker centres. I did online research to find the Tamil translation of “Tiong Bahru market”. They were kindly verified by two Tamil workers who were passing-by. A resident also helped to contact her Indian friend to re-verify the words in case Singapore Tamil is different from India’s Tamil. 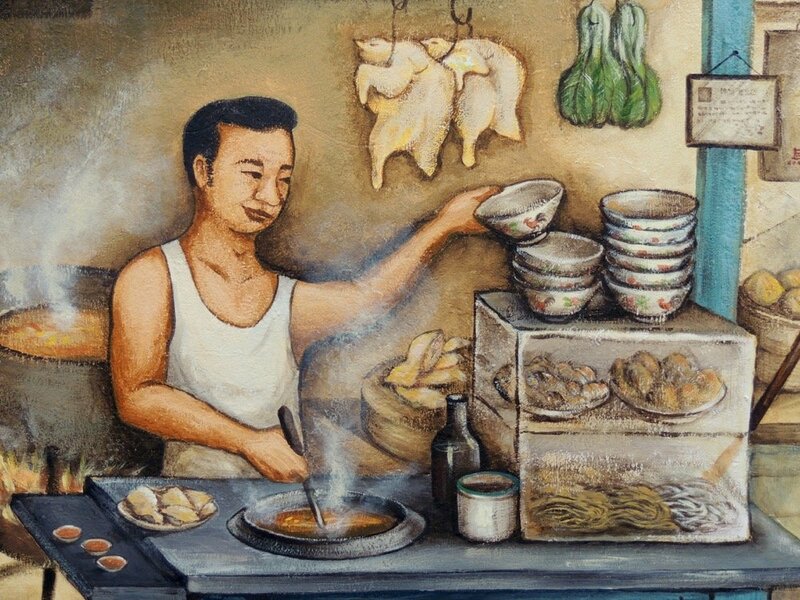 Re-creating a hawker stall on the street has always been my dream. The black and white photograph was too small and blurry. These details were my extrapolated imagination of the vague photograph. I painted these characters exactly as they were written on the actual signboard. 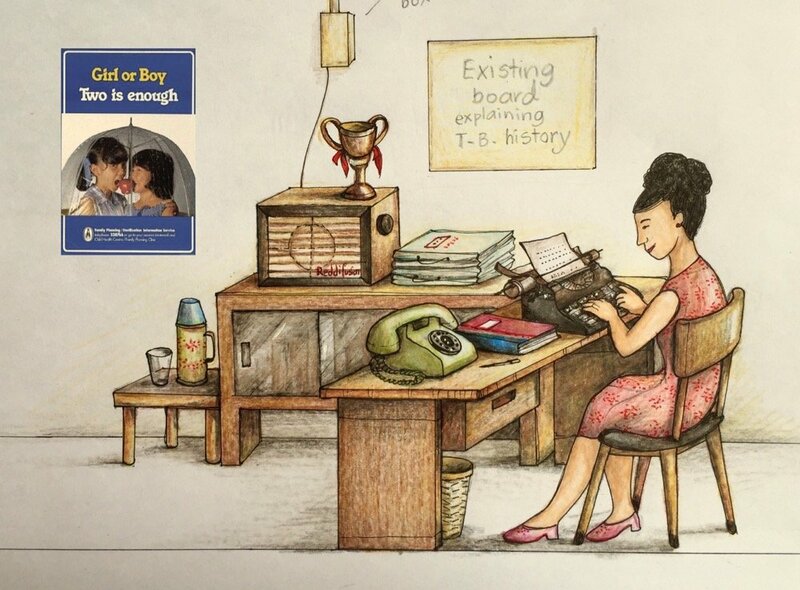 Thank you for sharing all these wonderful stories behind your mural, it’s such a joy to read them. I first saw your mural on a friend’s instagram, the one that’s drawn at ARC coffee. 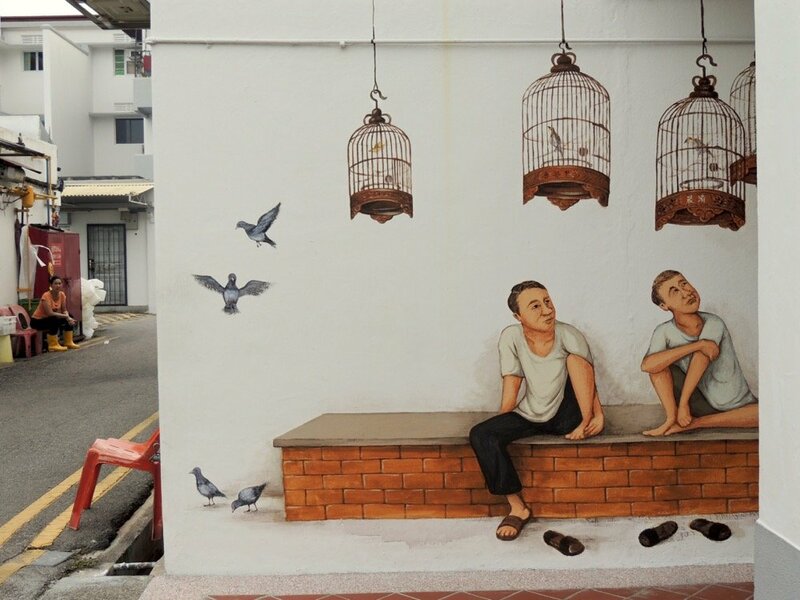 After which, I chanced upon your other mural at Tiong Bahru and instantly recognised them. Even though you think you are untrained in art, these drawings are so amazing and what you’ve shown now must be sheer talent! Keep making art! These beautiful spaces will always make people smile! Wow! 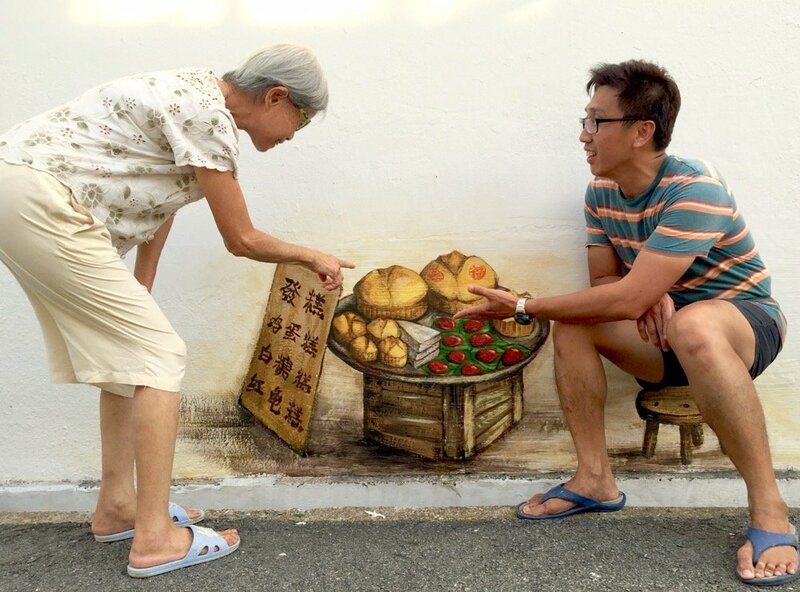 I must add a visit to see the murals on my next visit to Singapore. Tiong Bahru is a place that my wife and I love to visit and this will add another dimension to a visit. Will have to do so during my next holidays. Please keep them coming. It’s really very nice! Gambate! Living close to the Everton Road murals, I was lucky enough to see you in action. I can’t wait to see your new work in Tiong Bahru. Keep up the amazing work & thank you for bringing some of Singapore’s history back for those of us who weren’t fortunate enough to witness it first hand. I hope those who have seen the murals will get to know the stories behind them. Fantastic job and I will go see them soon! Hi Scott, thank you for your kind message! I hope you will like seeing the murals in real life. AWESOME artworks as always. We’re so blessed to have such a talented artist in our midst & giving us such joy when viewing your work. Thanks! Hi Valerie, Thank you very much for your encouragement! Wonderful art! Is there any way to reach you? I have just came home from my walkabout along Tiong Bahru. Finally, I get to see the three murals. They were beautiful! It is like a dream come true for me! Thank you! Looking forward to seeing more of your works! All the best! I went down with my daughter yesterday to visit your amazing art! Thank you so much, as it is because of you I feel more connected to my roots in India. Singapore has an amazing culture and you helped to keep it alive. I can’t believe you are not trained in art. Hi Radhi, Thank you very much for your appreciation, and for visiting the murals. 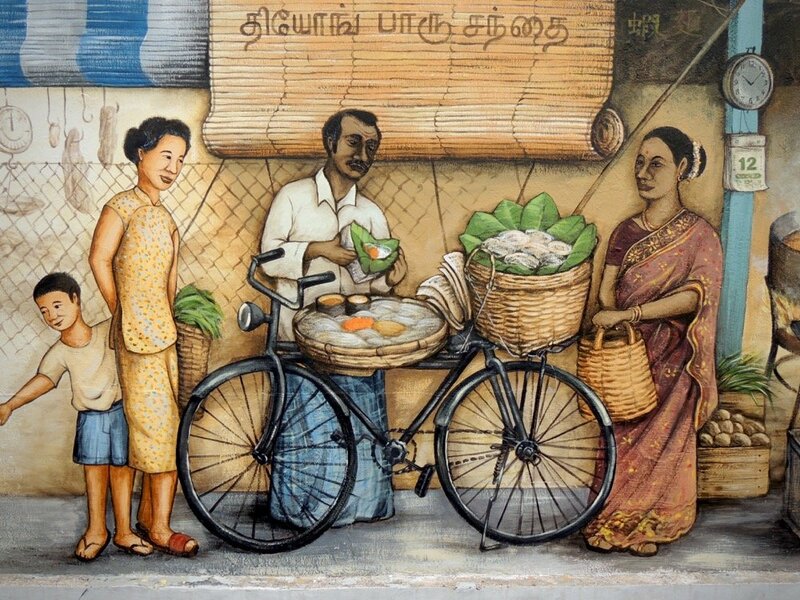 I hope to have an opportunity to paint in Little India one day! Thank you April for your appreciation. Tourism Board has not demonstrated support for the promotion nor maintenance of these murals.